What is Meet and Greet or Chauffeur Parking? This is easily our most luxurious product - simply drive direct to the airport terminal where you will be met by a fully insured chauffeur who will help you with your luggage before taking your car to a secure storage facility for the duration of your trip. Your car will be waiting at the terminal on your return. Simple and efficient - the way we like it! What is off-airport car parking? Off-airport car parking are services that operate outside of the airport perimiter and are generally nothing to do with the airport. A shuttle bus is required to take you to the airport terminal. The car park is situated within the airport perimeter. On-airport car parking is usually the closest service to the terminal, with the shortest transfer times. Gate price is the term used to mean paying on arrival or on-site, these prices are from 10% to as much as 60% higher than the pre-booked price online. 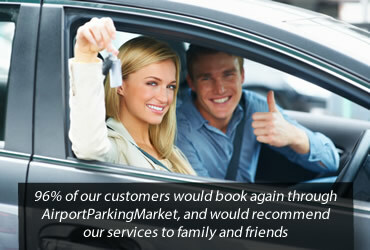 AirportParkingMarket is a pre-booking agent, all our customers are required to pay in advance for their airport parking. Our booking system is completely secure as it is protected by 256 bit SSL encryption provided by GeoTrust. Transfers to and from the airport are included in the price? Airport transfers are normally included in the price you are quoted. There are a few car parks that have service limitations, usually late at night and/or early in the morning, and the car park may collect an additional surcharge if you are leaving or arriving during those hours. If this is the case, you will be advised prior to completing your booking online. You can book your car parking at anytime. The booking process only takes a few minutes. Automatic Number Plate Recognition (ANPR) is a system used by some car parks to allow you to enter and exit the car park. Your confirmation will show if your car park uses this system. When you arrive at the entrance of the car park a scanner will read your number plate, and if you have a booking it will allow you to enter the car park. Arrival time will be dependent on the location of the car park to the airport and you should check your email confirmation for further details. As a guide you should ensure that you arrive at the car park at least 45 minutes prior to your flight check-in opening time. Your email confirmation will be automatically generated and send by our booking system, following successful completion of a booking and should be received within an hour. Please check your "junk" or "spam" email folders. If it is not there, Contact us office@airportparkingmarket.com. Be sure to provide your name, email address and booking reference. Yes, you will receive confirmation via email within a few minutes of completing your online booking. Email confirmation contains a telephone number you must call if you need to amend or cancel your booking. Please be aware that cancellations or amendments may be subject to charges from the parking provider. Please contact our team by email office@airportparkingmarket.com or by telephone on 0345 4599 250 to make an amendment. Please have your amendment details ready.